For the next few weeks you will not see any newsletters as we are taking a break from our weekly program. We will resume in September and hope you enjoyed the summer educational program on Social Security. As always, I am here for you to answer any questions you may have. I am wishing you an enjoyable, safe and happy August. The unseen hand of antigovernment ideology can be found everywhere nowadays — even in your mailbox. The proof is in what you won’t find there, like your annual statement of earned Social Security benefits. It’s also getting a lot harder to find Social Security field offices, or even to find someone to pick up the phone, as the Social Security Administration enters into yet more rounds of steep budget cuts. The question is, why? Social Security may be the single most efficient benefit program — public or private — in the country. Its annual operating expenses are less than 1 percent of overall costs, a figure which private sector programs should envy. In fact, that percentage has plummeted over the last fifty years, from 2.1 percent in 1963 to 0.8 percent today. That figure could be increased significantly without substantially changing the plan’s overall fiscal outlook. It’s certainly not a ‘deficit’ issue. Social Security is completely self-funded from contributions earned by benefit plan members. It draws no funds from the overall federal budget. That means the only people hurt by these budget cuts are the same people who paid for these benefits — and the services needed to deliver them — in the first place. It’s a simple game. Slash funding for well-run government programs, then use the resulting chaos as “evidence” that “government isn’t the solution, it’s the problem.” It’s simple — and relentlessly cynical. Social Security recipients — including the disabled, the elderly, and children — pay a high price for this ideologically motivated crusade. That tells us that the people who govern us can be extraordinarily insensitive to the human costs of their actions. Many disabled and elderly Social Security recipients depend on field offices, and the workers in them, to help them navigate the system. Here’s how cynical this game gets: The very same Republicans who are using healthcare.gov’s problems as proof that “government doesn’t work” are driving an ever-increasing share of Social Security’s administration onto the Internet — and then underfunding that effort. We were also told with great fanfare that eliminating the mailing of annual statements would save $70 million a year. But, as Michael Hiltzik of the Los Angeles Times notes, that is a tiny number — roughly 1 percent of an administration budget that is itself a small percentage of total costs. A cynical observer might conclude that one reason for ending this practice is to prevent Americans from noticing the change if and when Social Security’s benefits are cut against their will. You can see how things are changing with the strain Baby Boomers are putting on our already overburdoned system. The time is now to take care of your future and not rely on anyone else! And don’t forget our Summer Cash bonus which can go right into your pocket. Remember me to your family, coworkers and friends and earn your summer referral bonus of $1000 cash. WASHINGTON (AP) — Budget cuts have forced the Social Security Administration to close dozens of field offices even as millions of baby boomers approach retirement, swamping the agency with applications for benefits, a senior agency official told Congress Wednesday. Better Internet access and more online services are easing the transition, said Nancy Berryhill, the agency’s deputy commissioner for operations. The committee held a hearing Wednesday after issuing a bipartisan report showing that Social Security has closed 64 field offices since 2010, the largest number of closures in a five-year period in the agency’s history. Nancy A. Berryhill, the Social Security Administration’s deputy commissioner for operations. “They don’t do any kind of analysis on what would happen to a community when their field office closes, including figuring out how the most vulnerable populations would make their way to the next-closest office,” said Sen. Bill Nelson, D-Fla., chairman of the Aging Committee. “I can hire a lot of employees with $4 million,” Berryhill said. but it’s too good to last! Warren Elkin has had an A+ Rating since 1977! That’s over 36 years without a complaint! To make sure you are making the best financial decisions for your own retirement situation,contactus at 877-476-5051 or visit our websitewww.warrenelkin.com to learn more. To say thanks for spreading the word, Warren Elkin is launching a new referrral program. If you recomend his services to family and friends, you will receive $500 cash money for each confirmed deal. If you don’t have your own copy, please call us at 877-476-5051 or email us at elkininc@aol.com and we will send a complimentary copy to you or any of your friends and family! Want to know more about protecting and growing your principal? Want to know more about creating a guaranteed income for life? Want to earn additional cash by referring Warren to your family and friends? Call Warren today at 877-476-5051! I’m excited to announce that we are offering a $500 referall program, where cash money is paid to you directly from us for any referall that results in a confirmed deal. Want to know how you can earn additional money by referring friends and family, just give me a call at 800-475-5051 to find out more. It’s almost Superbowl time and the hopes and dreams of Seattle and Denver are on the table. In the spirit of that hope, I invite you to read this article that I found particularly of interest with respect to investments. Buy and Hold or Buy and Hope? As a result of Wall Street propaganda and doublespeak, the investing public is at a huge disadvantage when navigating the markets. From sea to shining sea, broker dealers tout the mantra and sing the praises of Modern Portfolio Theory (MPT), also known as the Buy & Hold strategy. The name is misleading; MPT is anything but modern and was developed in the 1950s. The main ideas of MPT are that buy-and-hold strategies are best, and that there is safety through diversification. That sounds logical, but Buy & Hold often doesn’t work out as planned. Furthermore, outside of bonds, there is an extremely high degree of correlation across equity asset classes—making diversification an illusion. Let’s take a closer look at what MPT really is: a passive investment approach. In no other life endeavors is passivity successful: not in raising children, career advancement, athletics, or any other field. Why should a passive approach work in the most highly competitive endeavor in the world? The most dangerous part of buying into a passive strategy like MPT is the frequency of recent market disasters. It is only now that the market is back barely at or above 2007 levels after falling off to 6500 in February of 2008. Also, remember the fun in 2000, 2001 and 2002? Do you remember the Asian Contagion and The Russian Flu in the summer of ’98? What about the recession of ‘94? The recovery rate from recent market disasters has been abysmal. As of December of 2011, a buy-and-hold investor in the S&P 500 would still not be able to break even. The graph below shows the Value Added Monthly Index, tracking the value of $1,000 invested in the S&P 500 in January of 2007. While it is not possible to invest directly in the S&P 500, one can invest in a mutual fund that tracks the S&P 500. This would then include fees, possible commissions, and 12b-1s, creating a drag on the performance and likely making it so the mutual fund underperforms the benchmark. An investor who bought in 2000 and listened to his broker‘s advice to hold on because “the market always comes back” would have seen massive fluctuation and periods of enormous loss. The question is this: did he “Hold,” or did he “Fold” at any point in time? If he held on, there would have been a lot of pain and anguish, often leading to a buy high, sell low effect. Dalbar reports that from 1991 through 2010 the S&P 500 20-year average was 9.14%, while the average mutual fund investor earned 3.83%. In spite of the popularity of the Buy & Hold strategy, it does not take human emotion into account; most investors buy high and sell low. When the market is down or declining, people become afraid and freeze or sell. The opposite happens when the market is rising; people watch it rise, become more comfortable, and, believing that it is logical and safe, they actually buy triggered by an emotional decision based on Greed and Fear. As seen in the charts below of the DJIA and the Inflow/Outflow into US Equity Funds chart 1995-2011, the majority of capital inflows are near the tops of the DJIA and the majority of the outflows are near the lows. Buy & Hold is a bad idea, but buying high and selling low is worse. Now that we know why Buy & Hold doesn’t work, let’s take a look at the other reputed benefit of MPT: diversification. Most equity portfolios are invested and diversified among the major indexes such as the NASDAQ, Russell 2000, S&P 500 and the MSCI EAFA (one of the major indexes for international holdings). The chart above shows the value of $1,000 invested in these indexes from January 2007 through December 2011. As with the S&P 500, we are not actually able to invest in these indexes; however, as many people do invest in no-load equity index mutual funds, this will give you an idea of what is going on. What we see is that there is an extremely high degree of correlation between these indexes, meaning that they really do move up and down together. Using the S&P as the benchmark to judge correlation, we can see that these other major indexes move in similar fashion. A .92 signifies a 92% correlation, meaning that they move together. A 1 correlation means they move up and down in tandem. Let’s take this a step further and look at how some well-known mutual funds are correlated to the S&P 500. The chart above shows the growth of $1,000 invested in January 2007 through December 2011 among some of the most widely held funds from the “Large Funds” category on MSN Money . There is a very high degree of correlation to the S&P 500. This is actually exactly what they are supposed to do. The mutual fund manager of a large cap fund is supposed to buy large cap stocks and is generally 95 % to 98% fully invested in large cap stocks. The fund manager does not have the option to move the invested dollars of the fund to cash because his mandate is to own large cap stocks. That means that even if the fund manager knows in his heart that the market is going to plummet, he must stay almost fully invested in large cap stocks. This is why large cap funds go up and down with the market. Now that we have looked at the most widely held Large Cap funds, let’s take a look at the best funds. Using the funds listed in the popular annual CNNMoney article titled”Money70: The Best Mutual Funds You Can Buy,” we compared the best Large-Cap funds to the S&P 500, as illustrated in the graph below. Once again it looks as though there is a very high degree of correlation. Let’s look at the actual numbers. The Vanguard Total Stock Mkt Idx Inv has a correlation of 1, meaning it is moving in tandem with the S&P 500. That manager is doing exactly what his mandate tells him. He is mirroring the S&P 500, which he does by buying S&P 500 stocks. If this does not seem difficult, it’s because it is not. There is actually no investment expertise going on in that fund. The correlations of .94 to .99 are a result of fees and of not owning an exact mirrored allocation of the actual S&P 500–but they are pretty darn close. The point is that in the traditional investment world, there is no safety through diversification because the assets recommended to clients on the equity side have an extremely high degree of correlation. They move up and down together, and they have an even higher degree of correlation in times of crisis–when true diversification is most important. If you are sitting across from a stock broker that tells you about the advantages of MPT, safety through diversification or Buy & Hold, smile politely, grab your hat and run away as fast as possible. MPT has been disproven because there is no safety in diversification of highly correlated assets. Then remember that Buy & Hold plus human emotion turns into Buy & Hope–which turns into Buy High and Sell Low. Your first step toward safety is to run away fast and find an advisor that shares this type of information. I hope you enjoyed this weeks newsletter and don’t forget to recommend me to your family and friends and earn a $500 cash money referral fee for every confirmed deal. Having enough money to last through your retirmement for you and your spouse doesn’t have to be a frightening propostion. With careful planning, education and understanding of the options available to you, both of you can look forward to a wonderful time in your life. To find out how you can earn 6% guaranteed with an 18% upfront signing bonus, contact me directly at 1-877-476-5051. Don’t forget to share this with your family and friends. I hope that you find this email interesting, insightful and informative. If you have any questions, concerns or are looking for a solid, no risk investment strategy, then please call me directly at 877-476-5051 or email me at elkininc@aol.com. When you think of safe and secure investments, I want you to think of me and please, don’t keep me a secret from your friends and family. If you are looking for 6.00% guaranteed interest rate with an 18% upfront bonus, please call me to learn more. Do You Know the Right Questions to Ask When Buying an Annuity? Click here to get your FreeWhite Pages now! See our complimentary movie about building wealth to last through your retirement, preserve your principal investment for your heirs and grow your money. Click here to watch. Now, You know from my emails that education and empowerment is always my motivation, but the current economy worries me and I need to tell you about it. I want you to be able to make more informed decisions now and better protect yourself before it happens. Take a look at the graph below. What it’s telling us is that the market (ex. 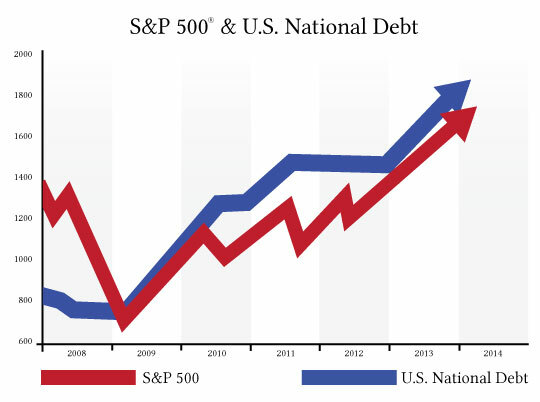 the S&P 500® index) is directly corresponding to our country’s national debt. The Fed is pouring money into the stock market to encourage investors to ‘stay the course’ in regards to their assets even though the United States economy is still in trouble. How long do you think they will keep this up? I believe this is a bubble – I’m calling it the “Fed Bubble” – and I believe it’s going to burst soon. When it does, there may be a lot of turmoil in the markets. For a time anyway. And that is time a lot of people don’t have to wait, not to mention the time needed to recover from the loss of invested assets. And like with the bond bubble, the real estate bubble and the dot com bubble before this, with purposefully-designed annuity strategies, your income account value can grow during a time money will grow nowhere else. Now I saw this article in Bloomberg this week and I thought I would pass it on. While plenty of baby boomers, born from 1946 to 1964, have become affluent, and many elderly across the U.S. face financial hardship, the wealth disparity of this father and daughter is emblematic of a broad shift occurring around the country. Many graying boomers are less secure financially and have a lower standard of living than their aged parents. The median net worth for U.S. households headed by people aged 55 to 64 was almost 8 percent lower, at $143,964, than those 75 and older in 2011, according to U.S. Census Bureau data. Boomers lost more than other groups in the stock market and housing bust of 2008, and in the aftermath many also lost their jobs at a critical point in their productive years. Lee Manchester knows her later life will be more austere than her father’s. She made a choice early on to become an entrepreneur rather than work for a large company with benefits, as he did. She started a commercial construction company in 1986 with $150,000 from a divorce settlement. She hired a dozen employees and succeeded in landing contracts supplying steel parts for buildings until the construction industry slumped in 1989. Bouncing back, she became a sales manager in the airport parking business. Still, she didn’t start saving for retirement until her late 40s, when her employer established a 401(k) account. Today, her retirement savings of $120,000 is right at the median 401(k) balance for households headed by baby boomers, according to 2011 data from the Center for Retirement Research. That will provide just $4,800 a year to boomers when they turn 65, assuming they take out 4 percent annually, the top amount many financial planners say should be withdrawn to assure retirees don’t run out of money during their lifetimes. Even if boomers like Lee saved more, they would have been hurt by a shift to 401(k) accounts from pensions in the 1980s. Thirty-seven percent of the elderly in the U.S. collect pensions, which provide some guaranteed income until they die. Fewer than 10 percent of boomers do, and that number is quickly shrinking. Lee worked in the airport parking business until 2009 when she was laid off from Parking Co. of America a few months before the company filed for bankruptcy. Although she found a new job in 2010 paying $52,000 a year as manager of the customer service department at Holo-Krome, a manufacturer of metal fasteners, it lasted only two years. She was laid off just as her second marriage ended in 2012. No longer able to afford her four-bedroom house in West Hartford, Conn., which she purchased for $225,000 at the height of the housing bubble, Lee rents it out for $1,600 a month to cover her mortgage and taxes and hopes to hold it until prices rise so she can recoup her investment. She now lives in the basement of her friend Brita Tate’s house in Wellfleet, Mass., paying $400 a month in rent. She found a job managing the spa at the Crowne Pointe Historic Inn in nearby Provincetown, where she earns $13.50 an hour working as a combination hostess, receptionist, fixer of gym equipment, and laundress. Lew Manchester hasn’t worried about money since retiring 23 years ago at 64. Every month, in addition to his $1,750 Social Security payment, he gets two pension checks: $1,000 from Marsh & McLennan, the last insurance company he worked for, and $783 from the military for serving in the Army Reserve for 20 years. He also has more than $800,000 in savings, close to $400,000 of which he cleared from the sale of his Hartford, Conn., home in 2005, when he and his then-ailing wife moved to an assisted-living residence in Northern California. During the next five years, while caring for his wife, who died in 2010, he was able to save more. A long-term care policy he’d purchased years earlier for $500 a month over 10 years paid out more than $275,000, covering most of their living expenses, and it’s still available for him to use if he needs it. Want to know more about protecting and growing your principal? Want to know more about creating a guaranteed income for life? Call Warren today at 877-476-5051! Do You Know the Right Questions to Ask When Buying an Annuity?Click here to get your FreeWhite Pages now! I Bet Your Mutual Fund Manager Won’t Tell You This. No doubt you have read the statistics over the years that perhaps only 30% of investment managers beat the market. Even that statistic is misleading because of all the fees and taxes an investor should consider. Mutual fund companies almost never warn you about your tax costs and also seek to hide performance lag. Here is one example. OppenheimerFunds Main Street Fund has about $6 billion in assets and the overall strategy we would estimate runs perhaps $20 billion under portfolio manager Manny Govil, who took over the fund in May 2009 after building a successful track record at other firms. When you read their online materials the company will show returns that, on the surface, seem pretty good. Comparing the fund to the S&P 500 would suggest Main Street fund delivered value, outperforming in 2009, 2010, 2012 and the first nine months of 2013. If you are a taxable investor pay attention to the fact that 20% of your profits will go to the government. This is also true if you select your own investments but unlike a fund you get to determine the timing of the tax liability. Then you have the “marketing expenses.” Oppenheimer will charge you 5.75% so they can pay the broker who sells you the fund on the front through its Class A shares. Many people instead opt for a different share class that foregoes the upfront charge but has a “back end” load if you liquidate in the first few years. Well, if you just hold it no problem, right? Wrong! If you opt for the no load route Oppenheimer will charge you 0.99% for “12b-1” fees instead of 0.24% as on the load fund. Does this extra charge help you? No. They use it to pay their sales people to gather more assets on the theory that more assets will spread the costs wider. Yet somehow the expense ratio on these funds will never go down. In the end, even with an above average money manager like Manny Govil running this fund the average investor will lose about (3%) annually when all the costs are factored in. Please call me to hear more about how you can earn 6% interest guaranteed with an 18% upfront bonus. Don’t forget to tell your family and friends. I hope that you find this email interesting, insightful and informative. If you have any questions, concerns or are looking for a solid, no risk investment strategy, then please call me directly at 877-476-5051 or email me at elkininc@aol.com.When you think of safe and secure investments, I want you to think of me and please, don’t keep me a secret from your friends and family. If you are looking for 6.75% guaranteed interest rate with an 18% upfront bonus, please call me to learn more.